It is that time of the month again when the Cake Slice Bakers share their selections from Maida Heatter’s Cakes. I have really been wanting to do a rectangular layer cake so I chose to do this Black & White Sponge Layer Cake out of this month’s choices. 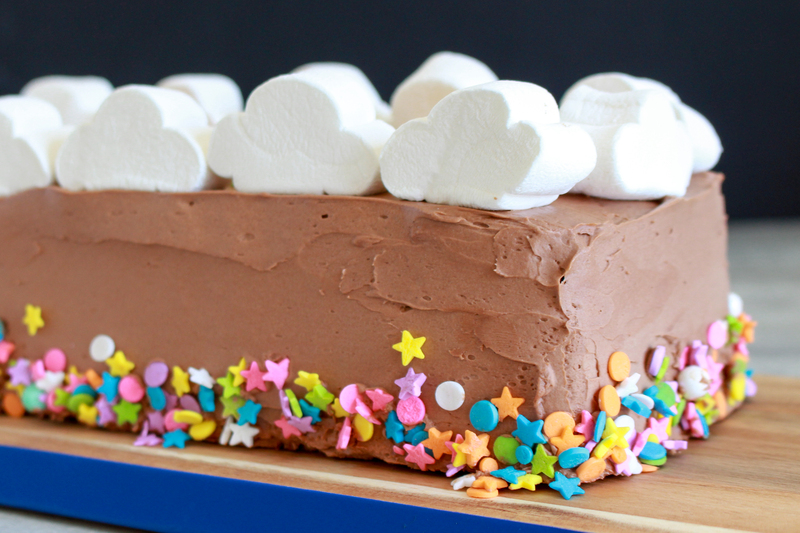 I was so flustered with the results I decided I needed to bring a little fun and color into the cake via sprinkles and these oh-so-adorable marshmallow clouds. Due to the many mishaps and lack of being “worth it” I decided not to share the recipe, but instead show the photos as a bit of fun baking design inspiration! To be honest, I was flustered with this entire thing from start to finish. The layers are composed of vanilla sponge cake and chocolate sponge cake, alternating with chocolate buttercream in between each layer. The cakes were delicious on their own but got lost by the heaviness of the buttercream. The vanilla layer especially was hard to work with. I worked quickly like the instructions stated but I still ended up with a super-thin layer of vanilla cake because so much of it stuck to the paper. There are a LOT of steps in making this cake too. While the cake was good I did not feel like it was worth the effort required. 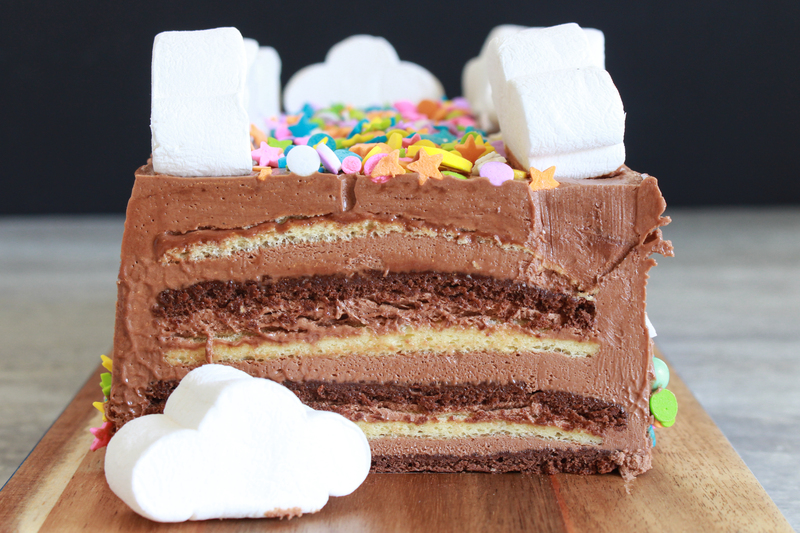 This entry was posted in Cakes & Cupcakes and tagged cake, chocolate, layer cake, sprinkles. Bookmark the permalink. Sorry that the effort didn’t match the results, but it looks wonderful! Love the cheerful sprinkles and clouds. It is super cute! I LOOOOVE frosting, but it does look like it might be overpowering the cake a bit. I am glad you went for it though, I love seeing all of the selections. Jolena, Did you use tinfoil or paper to line your pans? I had the same trouble with my first choice for last month (the jelly roll) and I used parchment paper… everything perfect until I tried to remove it from the paper.. into the bin it went! I tasted the cake and thought it was not worth a second try. 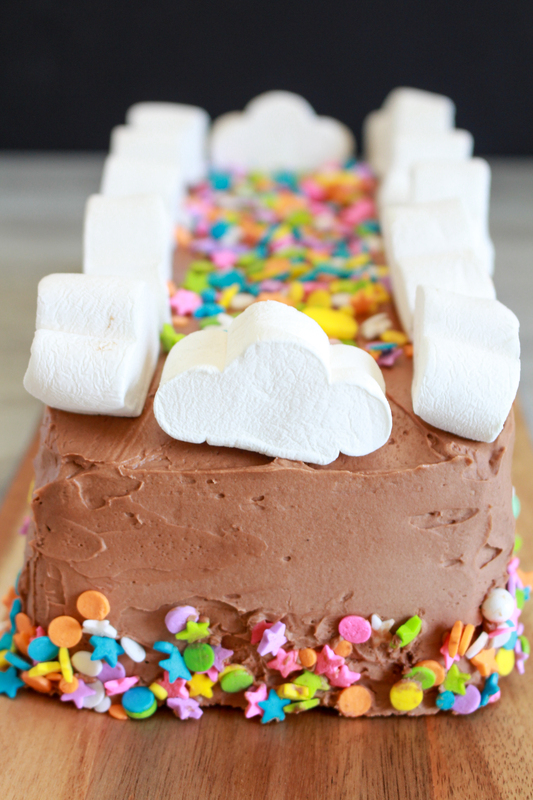 You earned extra brownies points for dressing it up in clouds and happy stuff! I used foil and paper sprayed with non-stick spray. The trouble came when flipping the cake out onto new paper! I hate when I work really hard on something and it doesn’t turn out. You dressed it up really nicely though. It looks so pretty but what a shame it didn’t seem worth all the effort. I admit I was put off by the long winded instructions. Too many steps to a recipe makes it no fun! Especially when the cake wasn’t worth the trouble! The cake did turn out super cute! My daughters birthday is next week, she would love this fun theme! oh girl I hear ya!! !